. :: Riverside Engineering Inc. - Products ::. 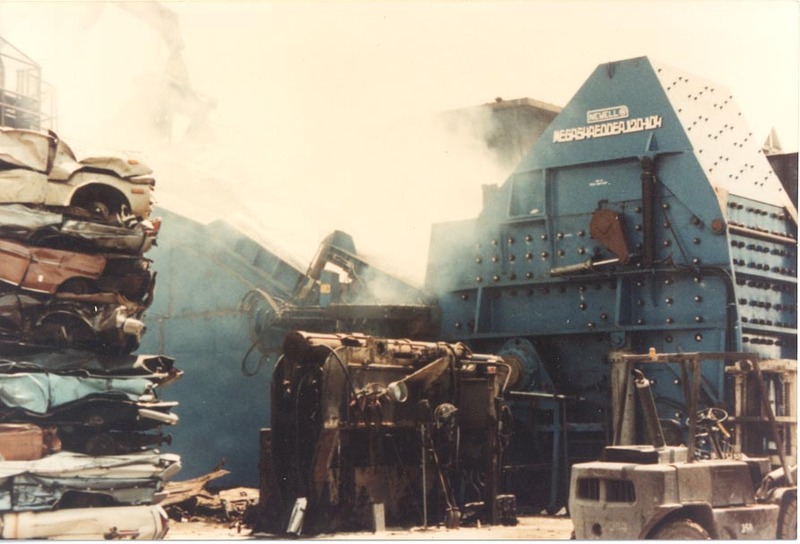 With over three decades of innovation and improvment, Riverside Engineering has yielded tough, strong machines of the highest quality, Our shredders handle steel, non-ferrous metals, ash from incineration plants, and construction and demolition materials. 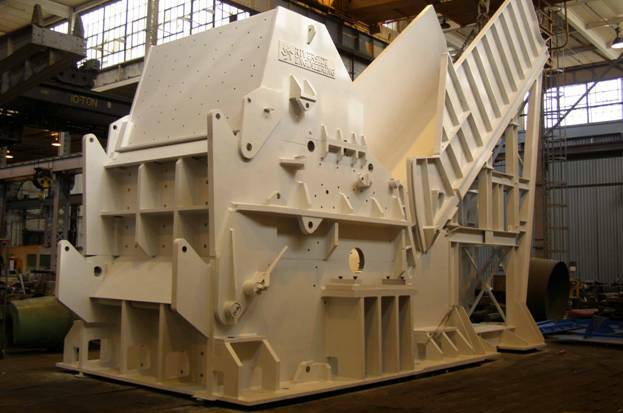 Engineered using extensive knowledge of material handling and separation, our machines operate with optimum efficiency. From 60" to 122" rotor diameters, our shredders embody our determination to build the most efficient and highest capacity machines available. 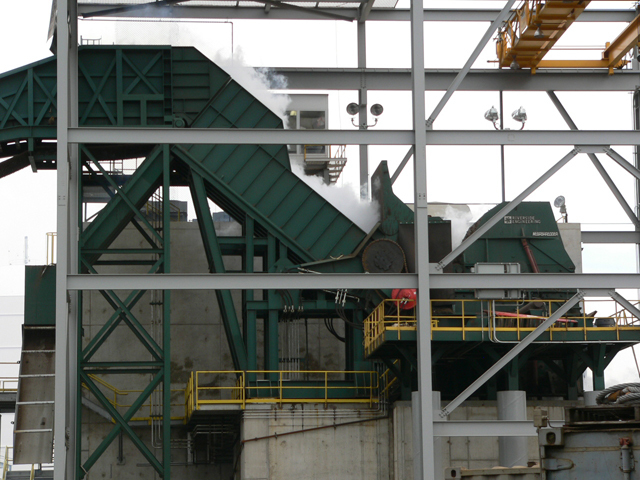 Our Infeed Conveyor is built to withstand the intense day to day operations of a scrap processing facility. Placed upon a strong truss back bone, our conveyor belt is formed through a system of triple grouser flights, chains, and specially positioned D-4 style track rollers to provide maximum support. 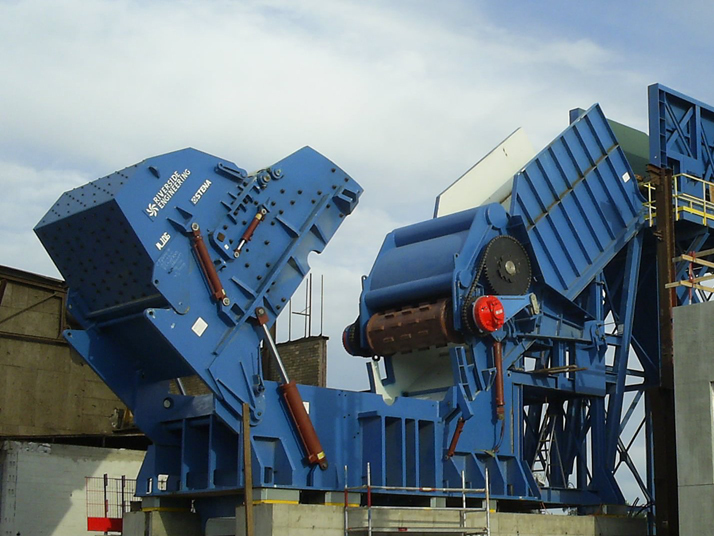 We use a choice of an electric motor or an Hagglunds Hydraulic Motor powered by one of our Infeed Conveyor rated Hydraulic Power Units that is strong enough to handle your scrap inflow with the speed control you want. Available as a retrofit for most existing shredders and standard on all Super Heavy Duty and Mega Shredders, the 36/60 Super Double Feed Roller features a 60 inch oversized top roller to provide a more even flow of material to your shredder thus increasing your machine's overall efficiency and throughput. Decreases downtime from unwanted feed roll jams and shredder plugging caused by influxes of infeed. 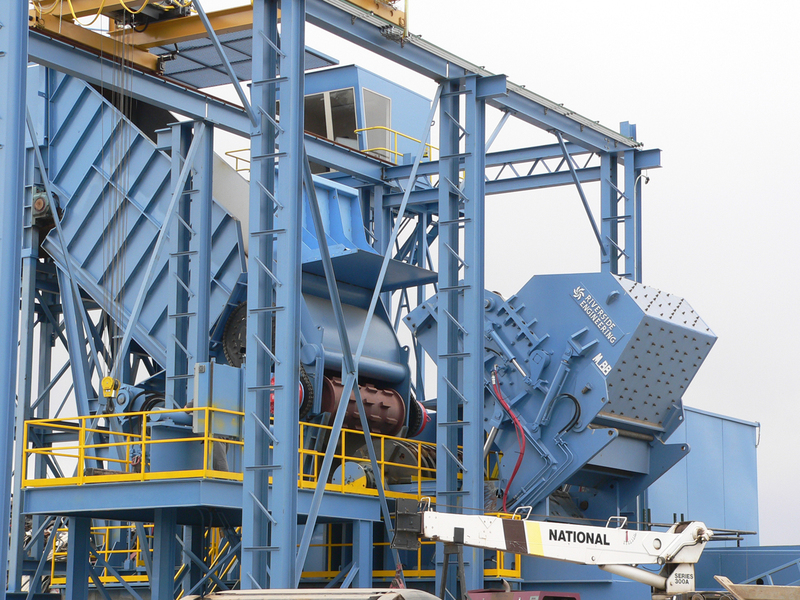 Provides a more even flow of material to the shredder and downstream separation systems. Will be built to fit your existing machine. Customers have seen an increase of 16-20% in production. 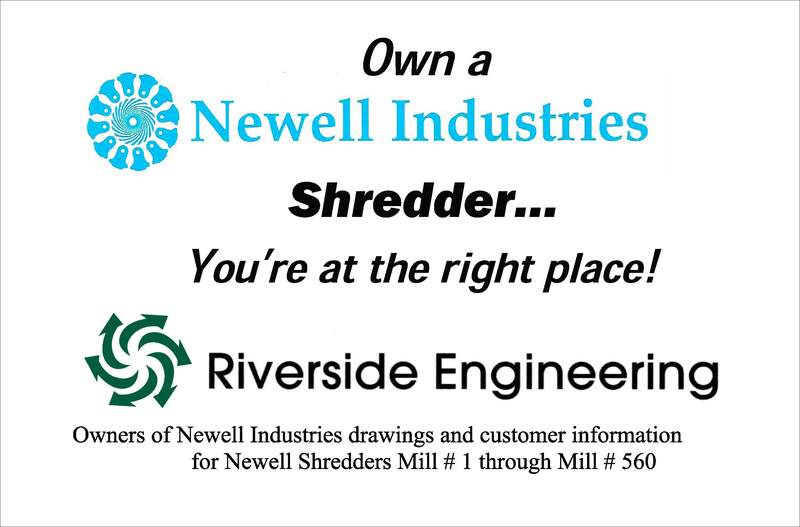 Riverside Engineering's System Integration Division provides custom automation and control packages for your new or existing Shredder and Downstream Systems. Our Sytstem Integration Division can maximize your Shredder throughput, maximize Shredder efficiency and minimize down time, using the latest in Allen Bradley Automation products and techniques. Contact our Sales or System Integration Division for more details. 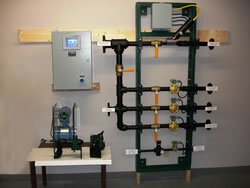 We are a Rockwell System Certified Integrator and a UL 508 Panel Builder. What is Shredder Cruise Control? Shredder Cruise Control is the new Feed Roll automation platform from Riverside Engineering. Shredder Cruise Control adjusts the feed rate, based upon mill loading, to maximize shredder output and efficiency while reducing the need for operator interaction. The use of PLC automation allows us to reach the true potential of your shredder by responding to mill loading faster and more consistently than an operator in manual control. The concept is similar to the operation of cruise control in your vehicle. The driver selects the desired speed. The car automatically controls the speed, allowing the driver to focus on performing other tasks, such as defensive driving. Shredder Cruise Control is quite similar . The PLC receives the shredder motor outputs that your operator monitors and your machine's operating characteristics to create an operating profile. This profile allows Shredder Cruise Control to adjust the speed, direction and height of your feed roll thus regulating the flow of scrap to your shredder for maximum operating efficiency. Like your car, the operator may take control at anytime using the joystick. The Shredder Cruise Control HMI will allow the operator to modify parameters in the profile based upon shredder and downstream limitations. Shredder Cruise Control can be added to almost any existing or new shredder control system. 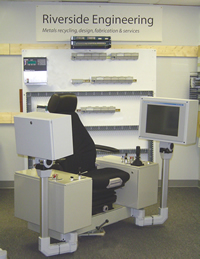 In existing PLC systems, as little as programming and operator training may be needed. Shredder Cruise Control can be a stand alone PLC package or incorporated into your new Feed Roll upgrade Package. We understand that everyone's needs are different. We can easily engineer packages tailored to your specific needs. Feel free to call or email us today with your questions and operational needs. Ask about our different levels and which one would work best for you. Riverside Engineering, in cooperation with Rockwell Automation, will spec out the Motor Control Centers for your power distribution and automation needs. Riverside Engineering's Remote Monitoring Service is like having one of our System Integration Technicians onsite 24/7. Through the use of the internet, our technicians can dial in to your PLC to assist in downtime troubleshooting down to the component level and apply program changes to fit your growing needs. This can all be done at our local office without the cost of sending a technician into the field. A computer like device that is used to monitor, control, and collect data of any type of machine. Ex. Allen Bradley SLC or Control Logix. Nothing more than a computer screen to enter and display data for the operator. They can be keyboard, mouse or touch screen based. Ex. 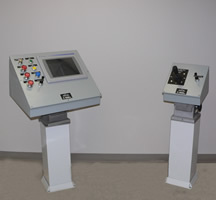 Allen Bradley Panel View Plus or Versa View. Inputs/Outputs (I/O): An input is any information coming into the PLC. Ex. Temperatures (RTD), Push Buttons. An output any physical action that the PLC makes happen. Ex. Starting a conveyor motor, Turning on a Light, An Alarm. Digital or Discrete I/O: Digital means nothing more than Off or ON. Is that motor running? Yes, it is. Turn that light on. The light is on. Analog I/O: Analog is a signal that varies proportional to what the device is doing or going to do. Make the DFR running at 50% of its max speed. The Cyclone fan is running at 77% speed. ORU tanks level is at 12 inches. The most common types are 0-10V, 4-20mA and Resistance Temperature Devices (RTD) or Thermocouples. For 0-10v, 0v is the low end (0%) and 10v being the high end (100%) . For 4-20 mA, 4mA being the low end (0%) and 20mA the high end (20mA) . RTDs change their resistance with the change in temperature. The H2PRO Water Injection System is a low cost and easily installable stand alone system that will help control the impact of everyday Shredder box explosions and reduce the amount of dust and emissions released by your process. H2PRO is a PLC controlled water injection system that is fully adjustable and can be easily customized in the field to meet most of your water injection requirements. The operator, or a Riverside Technician, inputs the required parameters into the PLC via Color Touch Screen. The PLC then calculates and controls the water flow to the Shredder based upon these parameters and Shredder motor loading. 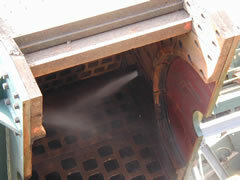 The low cost feature of our system is the engineering of our spray nozzle. There are systems on the market which require expensive high pressure pumps to force the water to atomize out of their nozzles. Riverside Engineering has devised a way of atomizing the water without the cost of these expensive pumps. H2PRO uses a combination of compressed air and city water pressure. The atomized mist provides the means for trapping dust and other pollutants and at the same time reducing the risk of the explosions and fires. Out of the box ready. With every H2PRO Water Injection System comes our easy to follow self installation guide. Our manual comes with detailed, simple to follow, electrical and mechanical drawings to ease the installation process. Riverside Engineering can also arrange to come on site and assist in the installation if needed.The ability to adjust and change operational parameters means H2PRO will easily adapt to meet your changing needs. Control the wetness of your product. Provides a means of monitoring daily water usage. Riverside Engineering's Rotor Turn Device provides a means of turning your shredder's rotor with ease during regular hammer replacement. We use a hinged gear motor, attached near the shredder main drive coupling to move your rotor via large geared disc mounted at the shredder drive coupling. An electric actuator will raise and lower the gear motor in place to engage or disengage the Rotor Turn Device from the Shredder Main Drive Shaft. During rotor maintenance, the rotor can be held in place with our Rotor Locking Device. 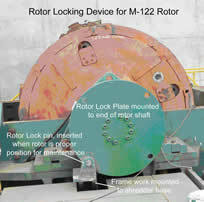 The rotor is held in place by a circular lock plate that is mounted to the non-drive side of the rotor shaft. The lock plate is constructed with holes that line up with a lock pin assembly to prevent the rotor from moving. Riverside Engineering's Rotor Turn Device and Rotor Brake System go hand in hand. 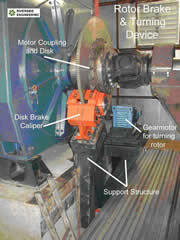 To brake the motor, we use a heavy duty caliper to apply press to the large geared disc discussed above. This will stop your rotor in approximately 5 minutes after the shut down of you Main Drive Motor the same way your disc brakes will stop your car. The hydraulic pressure needed to close the caliper is stored in a hydraulic accumulator via your existing hydraulic power units ready to be use with out the need your hydraulic power unit. The hydraulic power unit, which powers all of the hydraulic cylinder functions, is ideally located in a hydraulic room inside the motor house. In some installations it may be necessary to locate the hydraulic power unit under the feed ramp. The hydraulic power unit operates at pressures up to 3000 psi (207 bar) servicing the operation of the feed rolls, reject door, shredder tilt and hammer pin-puller. 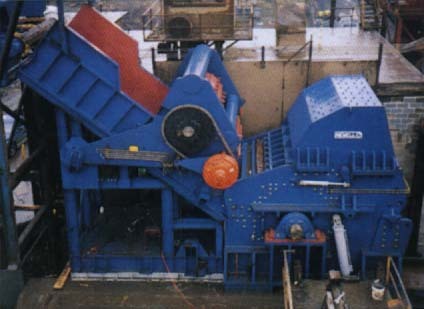 The shredder tilt and the hammer pin-puller functions are used only during maintenance and are controlled from a control box located on a 50-foot-long (15.24-meters-long) electric control cord. The shredder bearings are lubricated by an Oil Recirculating Unit (ORU) that is built on a skid and typically located near the main hydraulic unit. The ORU provides clean cooled oil to the bearings continuously by recirculating pumps mounted on a 60-gallon (227-liter) tank. This tank will be divided into two separate compartments, one for each rotor bearing. This will prevent the contamination of the entire oil tank in the event of a bearing failure. The heat exchanger for this unit will operate on water rather than air-cooling, and will be tied into the system that cools main drive motor liquid rheostat and heat exchanger from other hydraulic power units. We will mount a separate pump and motor on this unit for a standby spare that can be wired up in the event of a failure on the main motor or pump unit. The Super Double Feed Roller © system uses a pair of hydraulic motors powered by a 150-hp (112-kW) hydraulic power unit. The additional power is required to maintain sufficient torque at the higher speeds of the feed rollers. A proportional control card that constantly monitors the current of the main electric motor controls the speed of the SDFR©. In this way the feed rollers are constantly 'hunting' for the proper speed to feed the shredder. As the load on the shredder motor decreases, the speed on the feed roller increases. As the load on the shredder motor increases, the speed on the feed rollers will decrease or, if necessary, even stop. Use of the SDFR © increases production by minimizing the time periods when the shredder could be shredding but is not. It minimizes the effect of operator error or poor operating ability. The SDFR © does all of this and it does it in a way that tends to present a more even flow of shredded material to the downstream separation system. This is a specially designed hydraulic mechanism to facilitate the installation and removal of rotor hammer pins. We will provide a hydraulic cylinder, steel frame, and connection pieces to rotor. The layout of the plant is so that this platform and support structures mechanism will be mounted on concrete piers from grade level. Our Control Cabin is designed to provide the operator with a clear panoramic view of you entire Shredder system comfortably behind the safety steel constructed building with bullet proof Lexan windows. In this climate controlled cabinet, we house all the necessary equipment to operate your shedder, including our Shredder Cruise Control automation platform. On the out side, catwalks with hand rails are provided. Each Control Cabin is custom built to your specific needs. The purpose of the spring/damper unit is to isolate the shock loads and vibrations generated by the shredder from other local buildings and equipment. In practice it is only possible to achieve 70-75% isolation. The stiffness of the spring unit system limits the deflection allowable to about 0.5 in. (~12.7 mm). The springs provide the maximum isolation at normal operating rotor speeds. The dampers provide a mechanism for limiting deflection during large excursions that occur during start-up and shutdown as the rotor speed passes through the natural or critical spring mass frequencies. 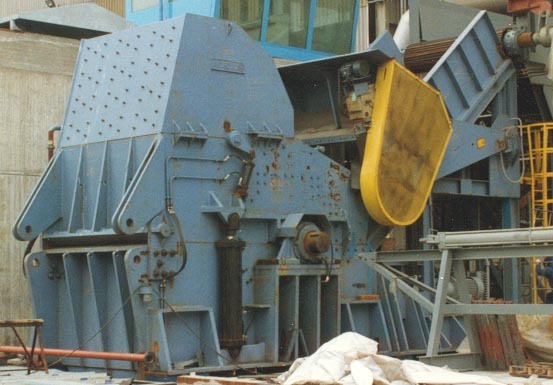 When the shredder and feeding device are mounted on the anti-vibration system, the shredder is field welded to the feeding device.